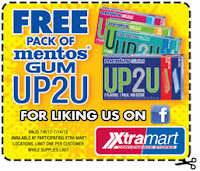 FREE Pack of Mentos UP2U Gum at Xtra Mart! Bring this coupon to your local Xtra Mart to get a free pack of Mentos UP2U Gum! Coupon expires 7/14/12. Click here to see if there's a store near you.